I actually don’t like pancakes. I wind up eating them once or twice a year and it always reminds me that I don’t like them. I do like crepes… and potato pancakes are fantastic. Got any snow in your area? Check out this snow Biff that Garrett posted in the Biff forum. Y’know, I’me not a pancake fan myself. I’ll eat a couple if they’re done but Im not a pancake fan. Although I do love waffles… which is pretty much the same deal. And yes. 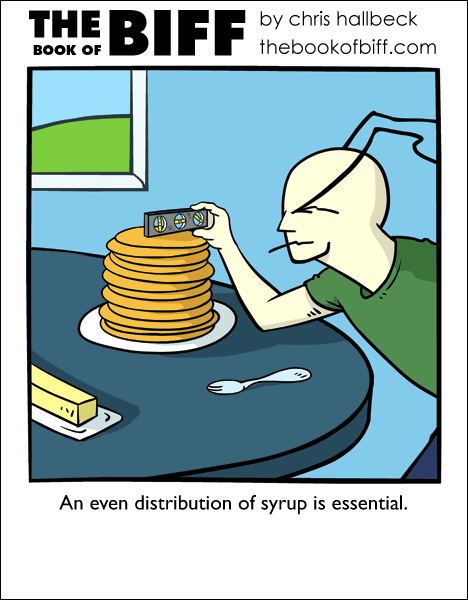 The distribution of syrup IS critical. The way it is put into three little lines makes me wonder if Seraphine’s comment was going to be a Hiaku. Maybe I just have odd expectations. I appreciate Biff’s dedication to his food… amazing that somebody so obviously into proper eating could screw up a recipe so badly as to create a sentient being out of brownie mix. It is ESSENTIAL….It must be even on each and every squear inch of the Pancake…Lest the world end in a blaze of syrup. Have you ever shimmed your pancake stack though? drenching my pancakes with it. normal pancakes don’t rock my world either, but i make strawberry banana pancakes and than cover them in fresh strawberries that i mix with a tiny bit of water and sugar ..mash them up a bit and dump on pancakes…yummeh! Pancakes, eh. I’ll eat them but they get so very saturated to the point where they fall apart and are too rich. Now my favorite sort of… cover-in-syrup-stacked-food is french toast. That stuff I eat until my spit starts to hurt. Bah, Americans do terrible things to pancakes. I like pancakes, but not American ones, they’re way too thick. That snow-Biff is awesome. We’ve got a little snow here in Tokyo, a centimeter or two last weekend which is all gone now, and today it snowed a little but that melted as soon as it hit the ground. So not nearly enough to make anything out of. I went to Germany with a group from my school. They all got German chocolate cake…the person in front of me got the last piece so I got an “Ice crepe” which is basically a big scoop of ice cream wrapped and sprinkled with tons of sugar. Better than the cake, in my opinion. How can you not like pancakes? They are god’s gift to breakfast. It looks like he’s measuring the evenness of the stack….! I just got back from Europe, and I didn’t like their pancakes as much, but I am sure it is just what I am accustomed to. This is one area where waffles one-up the pancake. Fill every square of the waffle, done deal. Pancakes…they just weren’t engineered to be the efficient syrup vessels that waffles are. My mother makes Pan CAKES, they are hooge and delicous mainly becuase the secret ingrediant is love! I don’t shim my pancake stacks, but I’ve been known to rotate individual pancakes to offset alternate thick and thin edges though, giving the same effect – A perfectly even and flat surface at the top of the stack. Butter goes between every pancake, and an even and uniform coating of syrup… else the world ends in a Biblical syrup flood. yeah, pancakes tend to make me feel all sluggish. i will however eat a ton anyway if they’re blueberry pancakes, especially if they’re wild blueberries from my parents’ backyard. crepes are delicious! I always get chocolate or cheesecake whenever I get crepes. I hate pancake STACKS though. You pour syrup on the top and only the top one gets most of it. Ha, you used the word “shim,” which is a great word! I love crepes! Theres an outdoor crepery(like a bakery) where I live, and it has the best crepes, especially with strawberry jam. I removed it for more reasons than your pitiful attack. It was starting to glitch up in ways you couldn’t have caused. yesterday my friend and I were helping make pancakes at church and at the end he decided to make super huge pancakes to use up all the leftover batter. They were probably about the size of an average frying pan and he made 3 like that plus two smaller ones. My dad makes the best pancakes ever XD He wears his special chef hat and we actually have this dish just for keeping pancakes warm. We got him a bigger griddle last Christmas, too, so now we have MAXIMUM PANCAKE-AGE. Hammer, screwdriver, level… what next? One time, I slept over at my friends house, and for breakfast, we had waffles. Now, I’m a huge fan of syrup, so I filled every little square with syrup. My friends may have looked at me strange for doing so, but damn, they were the best waffles ever. I love pancakes. I make them myself, so they will be in various sizes. I also enjoy latkes. My first one was during 2nd grade and we learned about celebrations from around the world and in our community. in england, we have normal pancakes, and scotch pancakes, which are fatter, but smaller. we only have normal pancakes on pancake day (shrove tuesday if u didn’t already know that) because they take so long to make. i love them, but they just arent quite filling enough. i presume you call crepes what we call pancakes, and scotch pancakes are like your normal ones but smaller. I actually don’t care for pancakes either. Sometimes they can be okay but I usually find them really dry and not very flavorful. I LOVE french toast though. Crepes are delicious too since you mentioned them. Don’t recall having a potato pancake before but it sounds good, I know I love potatos in general. I will make a snow Biff next winter should I get to the Cottage! Maybe someday the taste will grow on me. Great…now I’m hungry for pancakes…..whens the last time I had some?….Pancakes are fine and dandy till you add blueberrys…. The only problem I have with pancakes is that it always falls apart. Hurray for lefse! We always have it at christmas and it always makes me feel warm and fuzzy. Don’t potatoes release dopamine or endorphins or something? I like sourdough pancakes with maple syrup and strawberries or rasperries on top, but I can’t stomach the regular wheaty ones. Nilly, is it possible you’re dairy-intolerant? Just when I think I’m safe from the food-related strips… brb, caramel-covered waffles. I am the pancake monster! I prefer to spread out my pancakes on a large plate though, that way I can soak my pancakes in syrup more easily.